Lately I’ve been reflecting on the blameless life I’ve led, congratulating myself that the only people who would “come forward,” “take to Twitter,” or “retain an attorney” concerning anything I’ve done are people who regret not having praised me enough. But I recognize this pridefulness for the imposter it is, and must proactively share a shameful secret entirely, unqualifiedly, and without that little tailspin on it that makes you love me more for my nobility in admitting to a flaw, which you could then dismiss due to my youthful exuberance/troubled history/contributions to the arts/service to our country. I let my dog off the leash, in public, all the time. And I am indignant if you tell me not to. Though I otherwise haven’t a single moral, legal, or spiritual fly on me, I unabashedly let my dog run when there’s no one else around. And when people pop out of the shadows to yell, “You know he’s going to get hit by a car!” I curse them for their wishful thinking. 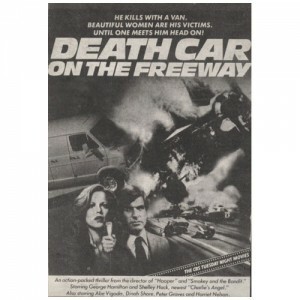 The only vehicle that would hit my dog is Christine, the truck from “Duel,” or the “Death Car” (it was actually a van) that menaced young Shelley Hack on the freeway. And we humans are just as likely as Dennis Weaver was to be victims of those supernatural/mortal maniacs. I’m prepared to be called a sociopath for my shameless flouting of the law, but know that there’s one dog-related temptation I’ve resisted. I haven’t printed a fake Service Animal ID for my dog, though the compulsion is strong. So many things would be easier for both me and America if I could take Gordon to any beach, on any plane, into any restaurant. But I know it’s wrong, and I know that Gordon, being a lopsided, stumbling idiot, would only ruin general acceptance of legitimate service animals. He couldn’t convincingly fake being a seeing eye dog (he is distracted by squirrels, trees, and air, and he trips me most days) and, even in the amorphous realm of PTSD service dogs, which is where most Fake Service Dog Tag abuse originates, Gordon’s mania and oral fixation conspire to make him a less-than-credible helper animal, and he would fail a background check. But the other day, while callously letting Gordon shamble and crash around freely in a park clearly marked, in several places, “No Dogs Allowed” (I see plenty of people bringing their dogs there, but we’re all part of the same hypocrisy), I met someone worse than me. “You see that big sign over there?” she said (I didn’t; there were no big signs, only lots of small ones facing the other way). “All dogs must be on leashes. It’s against the law to have your dog off a leash in [this quaint seaside community],” she repeated. Yes, she was shrill. If she were a man she’d be shrill, too, OK? Sometimes the word fits and we need to be confident about using it. I could tell she was the type of person who’d try to sell her child’s Girl Scout Cookies to the captive audience of a PTA meeting, or pretend not to see you while cutting you in line, or would throw an election by running as an independent. “OK,” I said. “I am sorry for the part we may have played in your or your dog’s trauma.” She left in a huff, dragging her dog behind her. Gordon trotted away and I put a leash on him, just in case she was calling 911, because that’s just the type of thing you know the residents of Amity were doing before Jaws showed up. Gordon would have never attacked the dog or its owner (“Until he does,” say the people in the shadows. “There’s always a first time!”), or have otherwise been bad. But if he had I would have regretted it and been angry with myself for not doing that one simple thing: putting him on a leash. As we left the park I checked the signs. 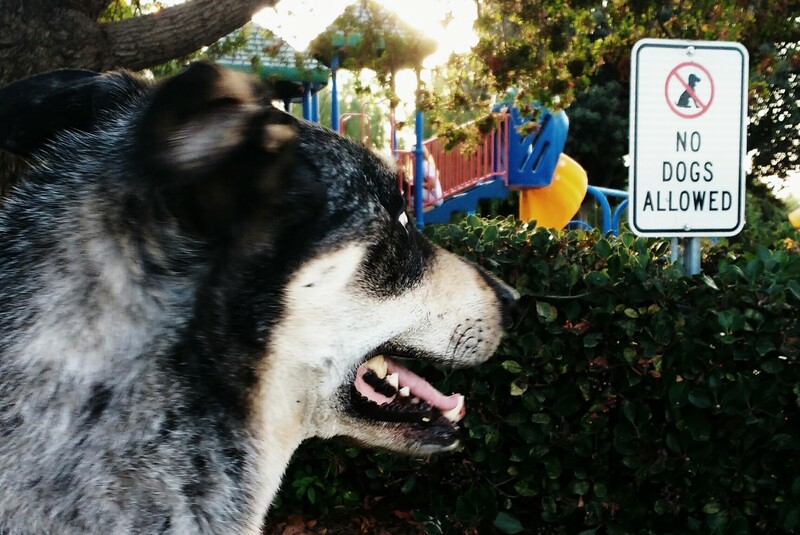 I had for so long not bothered to look at what they said, thinking that they didn’t apply to me or my exemplary, partially-recovered stroke victim animal companion, that I couldn’t be sure if they read “No Dogs Allowed” or “All Dogs Must Be On Leashes.” Either way I knew I was breaking the law. I get calls and letters every day from people who ask me if I’ve learned anything from this incident. Nope! But I do have a deeper, more nuanced understanding of how even owning an unconditionally loving pet is still powerless to prevent people from being passive-aggressive jerks to each other. Praise be your conflation of dog-parking with Seventies exploitation movies. By the way, I’ve never stumbled upon something so randomly and enjoyed it so much. Best couple minutes I’ve ever spent reading. I don’t read alot…. Thank you! You can see by my rapid response that I don’t tend to this site like I used to. How did you happen to stumble upon it?